November 3rd - 21st Century Business Association Speaking Engagement on Wikis and the Web. This topic is part of a 'Business Boot Camp' class being taught at Edmonds Community College. Learn more. November 10th - Twitter Information Session. Mark McLaren from McBuzz Communications will join us to talk about Twitter. He will be covering how it works and how it can work for your business. November 11th - ASQ-Seattle Dinner Meeting, Topic-'Done in a Day'. Through a fast-paced simulation, learn the basics of a simple, but disciplined approach, to quickly solving non-complex problems. Details. December 6th - Personal Excellence Workshop, Mill Creek, WA. Be productive in the next 5 minutes. Learn how to manage the daily chaos and still maintain focus on what's important. Curious? Learn more here. If you're interested let us know ASAP and take part in this deeply discounted workshop (Price: $150 | Regularly $350), by clicking on this special link. Check out the latest version of our Microsoft Outlook add-in. 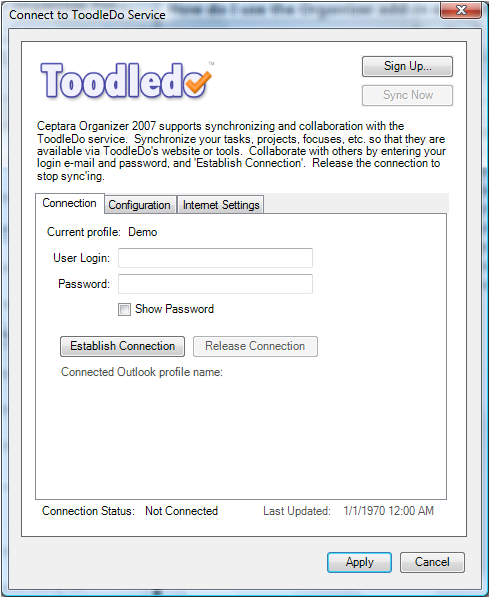 We've included Toodledo synchronizing capabilities, opening up the ability to sync your tasks with an iPad, iPhone, Droid phone and many more. We have also added the ability to find tasks in any folder supporting tasks which may be useful for folks sharing tasks via SharePoint or other server subscriber folder. We've enhanced tool tips in the Project Explorer list, enhanced mind map views and more. Make sure you have the latest version of Ceptara's Organizer for Outlook 2007+. Check out the FREE Trial. Be sure to check out the Demonstrations for a video tour or learn more about how the Add-In can help you stay focused by reading the Getting Started Guideline. Email Notifications Can Cause Divorce - Enough Already! Are your email notifications a distraction, taking away from the task in front of you? Do they demand your attention and are persistantly annoying? Learn how to maintain focus on your goals and projects by turning off notifications. Simple instructions are found in this article. Government agencies are under extreme budget pressures, asked to do more with less and maintain very high standards. At Ceptara we help you implement your strategy that promotes laser focus on the desired outcomes, while building a repeatable and sustainably improving system that will help you achieve your service goals today AND into the future. Download our Brochure to learn more. Failure Mode and Effects Analysis (FMEA) provides a structured method of identifying potential failures and quantifies the effects in terms of RPN (Risk Priority Number). FMEA is a tool used among quality professionals, read more about this tool here. Ceptara for Small Business - Grow your business and be more profitable. Often there is a big difference between an owner and an employee. We can help you develop a plan that excites your team so they act like owners, and develop a business system to focus everyone on the right things to assure that you're achieving your plan. Start your journey to higher profitability by learning how we can help you. Learn more here!